A collection of electric bluesy lead guitar instrumentals played along with some fabulous emotive tunes/collaborations I liked on Wikiloops performed by some very talented musicians. I prefer to try and capture expression and emotion in my playing rather than trying to play uber fast. So emphasis on bends, vibrato, slides etc. Feel privileged to play along and hopefully add some value and melody to the great performances. Started to play guitar again about 7 years ago after not playing for 30 years whilst I was busy doing other things in the heady worlds of Micro Chip Technology and Consumer electronics products. Hopefully these are tunes you can relax to. They were all recorded in harbour towns in the South West of England where I have lived for many years. 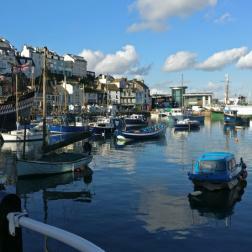 I now reside next to the lovely harbour town of Brixham in Devon after living for many years near Bristol in Somerset.